One afternoon in the summer of 2007, I was waiting in the dentist's office. This was pre-Android and only a month after the iPhone launched, so I had no screens to scroll and no feeds to skim. Looking around the waiting room, I noticed a 'brush more, fewer cavities' poster on the wall. I distincly remember thinking, "That is basically a Crest ad hung up as as piece of wall art. Why doesn't that happen in B2B?" When I got back to the office, I decided to try to make something worthy of being hung up. 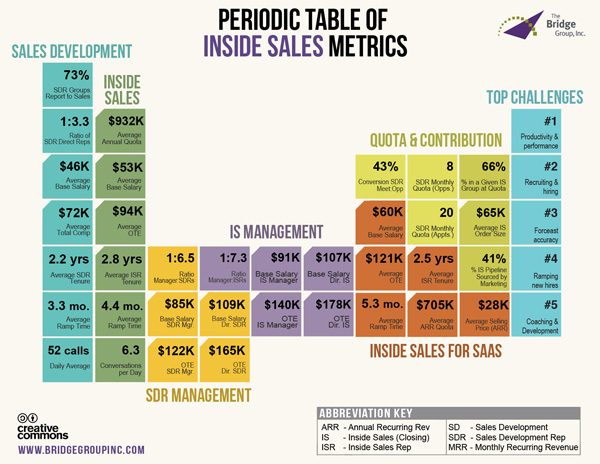 Six months later, we published Rev 1 of The Periodic Table of Inside Sales. We are currently in version six with over 15k+ downloads and I couldn't be happier. Here's an updated edition of the Periodic Table 2016 edition. P.S. Next time you visit the dentist, leave your phone in the car. Who knows what you'll come up with.